*In "The Fifth Turtle", Splinter celebrates his birthday. He previously celebrated his birthday in TMNT Adventures #45. 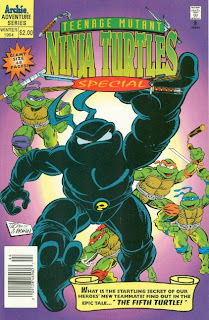 So, obviously, this has to take place a year after that, but it also has to take place before TMNT Adventures #53, when the narrative becomes so serialized there’s no longer room for this story to take place. I place it after TMNT Adventures #52 to try and give it the most time since Splinter’s last birthday. *Though I don't normally categorize TMNT Adventure stories as non-canon because of silliness, "E = MC Zip Lock" is just a bit too out there. The story is so stream of consciousness and full of impossibly cartoony nonsense that it simply doesn't work in-universe. Considering Mark Bode's last TMNT Adventures story, "Ninjara vs. Mondo Dog Catcher" was non-canon, I feel a bit better about this designation. This issue can be hard to come by these days. I'm glad you found a copy! the cover is slightly Chris Allan-ish, thought not totally.